The Food Alphabet and More: What's your Tokyo Tokyo Ramen Personality? + GC Giveaway! Tokyo Tokyo, the country's biggest Japanese fast food restaurant, is home to delicious and temptingly good Japanese fast food treats, from crisp ebi tempura, their gyoza, meaty beef misono to their maki selections and don't forget their trademark Red Iced Tea, which I am totally in love with (blame that on my wife, hehe), comes the newest addition to their line-up of mouth watering delights, the Tokyo Tokyo Ramen. For the past few months, Ramen craze has hit the metro, and there is no telling how far the road will take us, but so far, we are definitely enjoying the ride. Tokyo Tokyo Ramen features 3 interestingly unique ramen flavors, the Braised Pork Ramen, the Spicy Chicken Ramen and the Tempura Miso Ramen. Each has their distinct flavor that brings out the best in every Tokyo Tokyo Ramen. Be the traditional, enjoy a bowl of piping hot Braised Pork Ramen, with pork cutlets and thick tonkotsu soup, sure to warm up your tummies these coming holiday season cold weather. Kick things up a notch with the Spicy Chicken Ramen, spiced just right, you will be having your second bowl in no time. And last be the adventurous type with Tempura Miso Ramen, with Ebi Tempura on a miso infused soup base, will surely capture more tummies than hearts. The Hipster Dude! 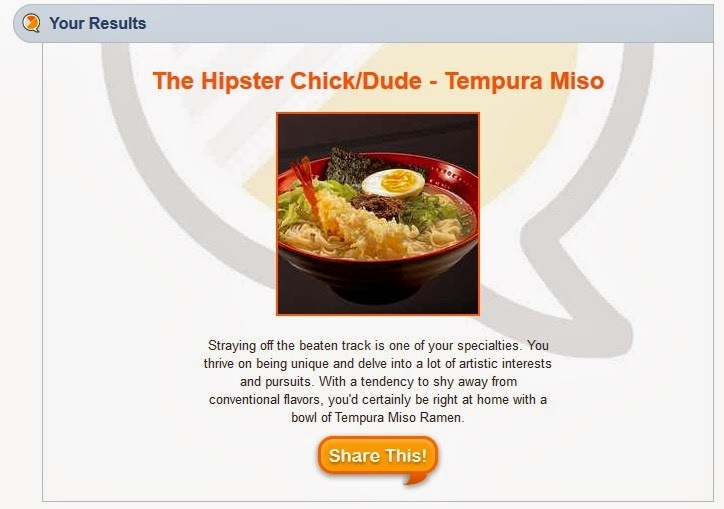 I'm definitely Tempura Miso! 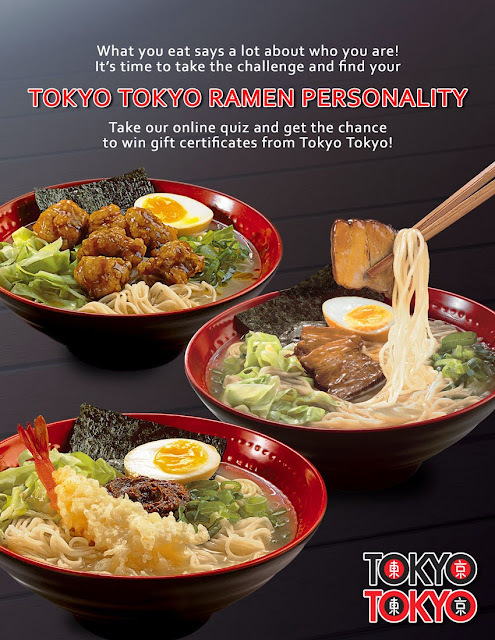 So go ahead and take the quiz now to find out what Tokyo Tokyo Ramen are you! You can win for yourself P1,500 worth of GC's from Tokyo Tokyo and The Food Alphabet. Just make sure you follow all instructions as noted on Rafflecopter. 1 winner will be announced on Dec. 4, 2013 to bring home the P1,500 worth of Tokyo Tokyo GC's! Join up for your chance to win!